Frankie's Apartment: Frankie's Apartment Fan Art! This strip comes from Glenn Manders, who lives in Brisbane, Australia. 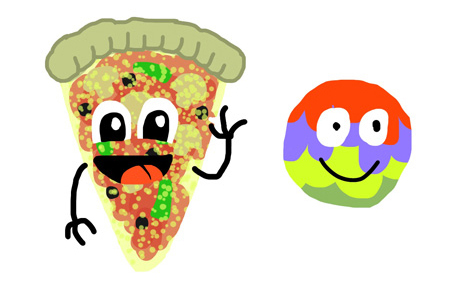 He does his own strip called Bad Teeth, which stars the guy with the cheeseburger head, Cheese, and his friend Buddy. Bad Teeth started as a zine in 2005, and has been regularly published in Rave Magazine, a music street press that is distributed all over Australia. 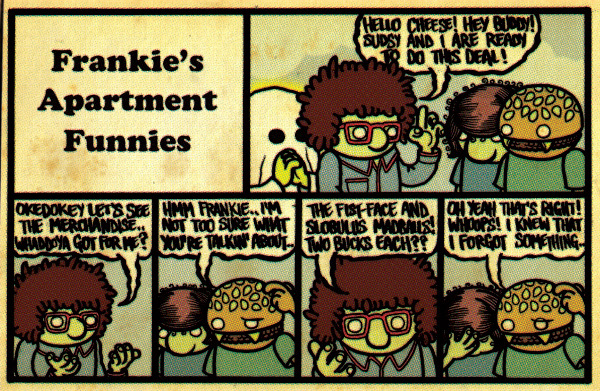 A long time ago, Sudsy used some of his "limbo-magic" and messed with all of the doors in Frankie's Apartment. Sometimes they lead to other rooms in the apartment, sometimes they lead to the 99¢ store on 1st avenue, and sometimes they lead right into a comic strip. You can check out Glenn's stuff at Bad Teeth. Australia is famous for kangaroos, koala bears, and one of Frankie's favorite candy bars, Violet Crumble. Violet Crumbles have a strange styrofoam-like center that is made out of honeycomb. They're tagline is, "It's the way it shatters that matters."